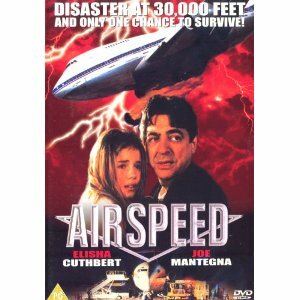 Film Review: Airspeed – I Love Disaster Movies! Spoilt brat gets on plane, plane gets damaged, spoilt girl says she’s so sorry for being a spoilt girl, plane saved… and we’ve all been there! Welcome to Airspeed, the mid air family drama…! In is a completely impossible premise, a private jet is hit by lightning which electricutes the crew and blows a hole in the cabin! Cue only uninjured teenage brat to come and save the day! Lightning, various dogdgy rescue attempts, hammy acting and a girl whose face you’d love to slap! Firstly I’ll start off by saying for a TV movie its really not that bad. There is some awful acting and sometimes the camera stays on something a beat too long (for example when a rescuer falls out the plane we’re treated to our teen girl screaming “noooo” and holding out her hand… then it stays there, and she could do a little pom-pom dance) but on the whole things are quite respectful. The actual disaster happens 15 minutes in after a quick pre amble which sets up your main lady as a precious little moo who just wants her parents love but they’re busy running a big business. The whole family theme runs throughout the movie and is bashed over the head a little bit. Once the big bang’s happened, new situations occur quite regularly and everything ticks along at a good pace and the fact the films only 84 minutes long keeps it fresh enough to hold your attention. It’s main problems stem from the wide range of acting talent and the fact the whole situation just could never happen anyway (not that we’d let that stop us enjoying a good movie). Effects are pretty grim it has to be said, but then they are used very sparcely and kept to quick plane shots which are dark and muddy to hide the low budget effect. Some of the props wobble (notably the plane dashboard!) but generally as the director has wisely focused on keeping the cameras straight on the people and not on the sorroundings, everything is passable. Airspeed is kind of difficult to recommend as it does nothing new nor does it do anything overly well or badly. If you enjoy cliched scripts and hammed up acting however, Airspeed is quite entertaining, as is the Elisha Cuthbert’s screaming on occasion! There’s also a superbly wooden pilot too to keep you amused. While I was tempted to go with the lead (Elisha Cuthbert) for her landing segment in the film, Lynne Adams who plays the mother out acts everyone in the movie by a mile although she is severely underused and left to babble “My baby” all the way through the film, she does it well! Well there’s only one and that’s the rescue worker who gets blown out the plane… but that cues up for the best “noooo” in the film. While the whole premise is weird in itself, Captain Lopez gets the award for his absolute robotic monotone approach to speaking which is so jarring and unnatural, you could be forgiven for thinking its a comedy. Airspeed is utter mediocrity in everything it does. It contains a tried and tested formula, a cliche ridden script, actors who are trying to lift themselves up above the melodrama but generally failing and some unintentionally funny moments. Just like an average TV disaster movie then I hear you say? Exactly, you get exactly what you see on the tin!